A first-time Pakistani visitor to Dubai whose life was saved by a Dubai Airports’ employee after he collapsed due to a heart attack at the airport last week is recovering well at the Rashid Hospital. 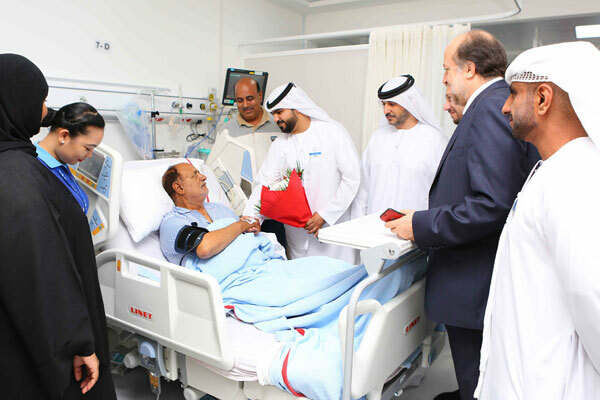 Representatives from Dubai Airports, including Mohammed Al Dewani, head of Terminal 1, and Talal Al Hubeishi, the operations officer whose quick thinking helped save Mohammed Sadiq’s life, and the Dubai Centre for Ambulance Services, visited the hospital on March 28 to check on his health and wish him a speedy recovery. “I didn’t know the man who saved my life until I met him this morning, and now I will never forget his face. I feel immense gratitude for Talal,” said Mohammed Sadiq.